Motherwell kicked off the new year where they finished the old one with a superb 4-0 win over a good St Johnstone. And while goals from John Sutton, Iain Vigurs, Lionel Ainsworth and James McFadden eased ‘Well to a fifth consective win with some style, both teams can take credit for serving up a festive feast in horrendous conditions. In a breathtaking 90 minutes of action, both sides had some amazing escapes as the respective goal frames were hammered an incredible 6 times. Despite his influential display in the 5-1 win over Thistle, James McFadden was back on the bench, alongside Zaine Francis-Angol, both making way for the inclusion of Shaun Hutchison and John Sutton who rejoined Henri Anier in attack. And the strike pair combined within two minutes when Anier’s pass into the box found Sutton but his lobbed attempt drifted over the bar. The Saints’ goal had amazing and controversial escape a minute later. Lionel Ainsworth’s corner drifted across the packed penalty area to Stephen McManus and his thundering drive cannoned down off the underside of the cross bar and bouncing up into goal before Alan Mannus could grab the ball. But despite the celebrations the assistant referee indicated that the ball had not crossed the line. The visitor’s goal was under seige at that stage and another Ainsworth corner found its way to Shaun Hutchison and his effort looked net bound until Mannus strecthed to scoop the ball off the line. Saints reply was a stunning strike from Dave Mackay which rebounded from Twardzik’s left hand post. Motherwell’s pressing start was finally rewarded after 20 minutes. A great break down the left ended with Vigurs sweeping a cross to the front post, where Sutton headed home his tenth of the season. Saints finally coped with ‘Well’s furious opening and Twardzik got down to make a great block from David Wotherspoon. Then a timely interception by McManus cut out Gwion Edwards cut back as the lethal Stevie May waited to strike. ‘Well came within inches of a second goal after 27 minutes. Ainsworth’s effort was blocked but the ball fell for Stuart Carswell whose volley from 10 yards rebounded off the inside of the post. With Saints no doubt thinking that a goal early in the second half would bring them right back into the game, it was Stuart McCall’s men who produced a killer second within minutes of the restart. Ainsworth cut in from the right to deliver a low drive which Mannus could only palm out to Vigurs who from 6 yards poked the ball into the empty net for his first Motherwell goal. It was Saints’ turn to be denied again by the woodwork when, after a goal mouth scrammble, May’s shot was brillainly turned onto the post by Twardzik. The game was end to end and Mannus matched his opposite number when he denied Ainworth, whose run from the halfway looked to perfectly finished, only to see his drive pushed onto the post by the ‘keeper. The winger was not to be denied his fourth goal infour games though and it arrived after 71minutes. Vigurs’ free kick was headed onto the post Hutchison, but the ball was only partially cleared and from the corner of the box Ainsworth rifled a drive across the ‘keeper to make it 3-0. McFadden came on for Sutton and, four minutes from time, completed the scoring when he curled a right foot drive from 25 yard drive beyond the diving Mannus. As the ‘Well players celebrated at the final whistle, Dan Twardzik took a well deserved final bow for his fine contribution having completed his amazing short term loan from Dundee, with his fifth win and third clean sheet. Looking back on the incident early in the first half. The ball actually hits the bar twice from McManus’ spectacular volley. Too hard to…. “I thought it was a fantastic performance. We keep reverting back to last season and the season before and the players we have lost, but I thought the second half was as good as we have been, on a par with anything. “The football was terrific and we have created some fantastic chances. Bear in mind it was against a side who don’t lose a lot of goals. “It was a good game. St Johnstone could have scored a couple, they have hit the woodwork a couple of times and we hit it three or four times. “It’s a strange game at times because it could have been 4-3 at half-time. “We didn’t start the game well, which was key. We let them get a good foothold in the game and the tempo they played at. “We settled down and created enough chances in the first half to be level but we did contribute to our own downfall. “The goals are poor from our point of view, ill-discipline and not dealing with one against ones, giving away soft free-kicks to a team that has good delivery. 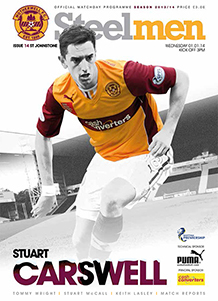 The eleventh domestic Steelmen Matchday Magazine of 2013/14 is on sale when St Johnstone visit on Wednesday. But what is inside the 64-page issue? ‘Well boss Stuart McCall, celebrating three years in charge at Fir Park, speaks about how trying to continue the recent run of form against a tough opponent in St Johnstone. The skipper also chats about recent victories and reflects on an excellent 2013 for the Steelmen. The feature interview is with midfielder Stuart Carswell. The youngster talks about nailing a regular first-team spot at the club and his hopes for the year ahead. Carsy also features as the next in the centre-page souvenir poster collection. There is a 11-page section dedicated to our visitors, St Johnstone. As ever, Ray Morrison introduces the Perthshire side and there’s a player-by-player breakdown of who is likely to line up for Saints. We also report from McDiarmid Park and the Saints went down narrowly to Celtic. Boss Tommy Wright also gives us an exclusive interview where he talks honestly about trying to continue some of the good work achieved by his predecessor and stamping his own authority on the team. ‘From the Press Box’ returns with regular host, the Herald’s Scott Mullen and the second of our Eggheads ‘Quarter Final’ clashes pits James McFadden against Keith Lasley. Our match reports section takes a look back at the 3-0 win over St Mirren and the excellent 1-0 success at Pittodrie. There’s also an in-depth report from the Under 20s 0-0 draw with Lanarkshire neighbours Hamilton Accies. Referee for Wednesday’s Scottish Professional Football League clash with St Johnstone is John Beaton. John will be handling his third Motherwell match of the campaign so far. He was in charge of the disappointing League Cup Quarter Final defeat to Aberdeen and his other was also against Aberdeen, when they travelled to Fir Park back in August; Derek McInnes side taking all three points in a 3-1 win. The 31-year old also took charge of two Motherwell matches last term too. The first was a 1-1 draw with Dundee at Fir Park; Michael Higdon rescuing a point after Nicky Reilly had given the Dark Blues a surprise lead midway through the first half. His other match that campaign was against Dundee United at Tannadice, the Steelmen running rampant in the City of Discovery, confirming second spot with a superb 3-1 win. Not only did Michael Higdon open the scoring with a peach from distance, the big striker surpassed Willie Pettigrew’s post-war record for most top-league goals in a single season when he netted the third midway through the second half. It has been a busy season already for Beaton both domestically and in European competition. This will be his second League Cup tie of the campaign having already handled St Johnstone’s 3-0 win at Hamilton Accies. He has officiated three Dons games this campaign and McInnes’ men have won all three (versus Kilmarnock, Motherwell and Partick Thistle). Abroad, he was the man in the middle for Poland U19s 1-0 home defeat by Armenia as well as Norway U21s’ 2-1 success over Macedonia. In European action, he looked after BATE Borisov against Celtic’s eventual Champions League opponents Shakhter Karagandy, as well as the UEFA Youth Champions League match between Arsenal and Napoli, the Gunners running out 4-1 winners. John will be ably assisted by Tom Murphy and Gavin Harris with Ian Brines on Fourth Official duties. A pictorial look back through Stuart McCall’s last three years as manager at Motherwell FC. Stuart McCall celebrated his third anniversary as ‘Well boss by lavishing praise on his players and staff. The 49-year old sat in the manager’s chair at Fir Park for the first time back in December 2010, and his three years have been littered with success, broken records and happy memories. Indeed, in terms of league wins ratio, the former Scotland midfield is the most successful top-league manager in the clubs’ history, with only Davie Hay producing better in the run-away First Division winning season back in 1981/82. Showing typical modesty that defines his character, McCall deflected all praise towards his small, hardworking and talented staff and the many players who have played a part in his 140 game run. Speaking to the gathered press at Motherwell’s news conference, the ‘Well boss, who knocked back a move to English side Sheffield United in the summer, said: “It has been an honour for me to be at this club for the time I have. “I’ve got to be honest, when I was first offered the job I wasn’t sure I’d last three weeks, let alone three years! “I remember back to my first game, a pretty dull 0-0 draw at Hamilton, then we faced a tricky Cup-tie at Dundee live on TV. I think everyone going there expected an upset, as Dundee were flying high in the First Division, but we managed a convincing 4-0 win. “I’m not sure I was an overly popular choice to take over from Craig [Brown] and Archie [Knox], and it was quite difficult at the beginning, particularly losing Mark Renyolds and Nick Blackman so quickly and coming into a dressing room which had just lost three games, to replace a duo who were popular amongst the players. “But I have got to say, I couldn’t be prouder of the three years, the staff, the players and everyone surrounding the club. Of course, there have been ups and downs, but certainly far more ups. Cup Finals, finishing third then second, playing in the Champions League and Europa League, breaking points and goal records and winning awards at the end of last season; it’s all been a great run. Bring in the New Year in spectacular fashion in the Davie Cooper Suite at our first every Hogmanay Party. We promise to make the last party of 2013 the biggest and best of the year. Not only will you be treated to a fantastic buffet, you can get in the mood with a traditional ceilidh before bringing in the bells with a fantastic disco and DJ. We will kick-off at 7pm and it will be a late finish. Tickets are just £20 and interest is already been high. If you would rather not book online, phone the Commercial Team on 01698 338008 / 338062 or email commercial@motherwellfc.co.uk to secure your seat. Extended highlights from Firhill as ‘Well stun Partick Thistle with a blistering comeback to win 5-1. Action pictures from the 5-1 win over Partick Thistle at Firhill in the SPFL Premiership. Stuart McCall was delighted with his side after they recorded an impressive 5-1 win away at Partick Thistle. Despite going behind early in the match, the Steelmen roared back and were 3-1 ahead at the interval – the goals coming courtesy of Keith Lasley, Zaine Francis-Angol and the impressive James McFadden. Lionel Ainsworth and John Sutton capitalised on defensive mishaps to add a fourth and fifth after the break, bringing 2013 to a satisfying conclusion. The day before his third anniversary as ‘Well boss, McCall paid tribute to the clinical nature of ‘Well’s attacking play saying: “Few would have envisaged that result after wee Lawless came back to haunt us with a great opening goal. “They started well to be fair, and it took us a wee while to get a grip of the game. “We said prior to the match that it was likely to be an open game. We knew they would create chances but we hoped we would so similar and we were clinical; that was the key today. Motherwell signed off 2013 in style with a clinical 5-1 win over Partick Thistle at Firhill this afternoon. Former Steelmen winger Steven Lawless opened the scoring, but any hope Thistle had of claiming their first Premiership win at Firhill was extinguished before an end-to-end first half finished. Keith Lasley quickly equalised before Zaine Francis-Angol scored an excellent solo goal and McFadden lobbed home before the break. Lionel Ainsworth and substitute John Sutton added to the scoring to secure an impressive victory for Stuart McCall’s side. The recalled McFadden also hit the bar as Motherwell again showed they have put their William Hill Scottish Cup defeat by Albion firmly behind them. With Shaun Hutchinson suspended and Fraser Kerr missing with a tight hamstring, McCall had to reshuffle his back four with Stuart Carswell at right-back. And the makeshift defence was cut open in the eighth minute as Thistle worked their way forward after Gabriel Piccolo had cut out Simon Ramsden’s ball forward. Kris Doolan played in James Craigen in the left channel and he cut the ball back for Lawless to steer into the bottom corner. Both sets of fans joined in applause for Phil O’Donnell, who died exactly six years ago while playing for Motherwell against Dundee United. Thistle kept up the pressure and Lawless almost doubled his tally with a 25-yard strike that Dan Twardzik pushed wide before Piccolo headed not far away from the corner. But Motherwell were level in the 15th minute. McFadden took the ball in from a throw-in, turned his man and slipped the ball into the path of Lasley, who placed the ball inside the far corner. The goalmouth action was relentless. Lawless played in Kallum Higginbotham but Twardzik raced off his line to block, and seconds later a Francis-Angol cross fell for Iain Vigurs but the midfielder could not head on target. Francis-Angol soon caused even more damage in the 21st minute after some sharp build-up play down the left with Steven Hammell at its heart. The former Tottenham trainee cut inside Stephen O’Donnell and squeezed a right-footed shot inside the near post – his first senior goal. Thistle made a change in the 27th minute when another former Motherwell player, Ross Forbes, came on for Christie Elliott with Higginbotham moving to the right. Doolan came close with a curler but Motherwell extended their lead in the 36th minute. There appeared little danger but Henri Anier pounced on a loose ball midway inside the Thistle half and lofted a pass forward for McFadden. The Scotland hero beat Piccolo for strength and skill and lobbed the ball over Scott Fox and into the corner of the net. McFadden and Forbes had spectacular volleys tipped over at either end as the second half started in similarly action-packed fashion. Thistle pressed but Motherwell moved further ahead in the 56th minute. Aaron Taylor-Sinclair appeared to have thwarted a Motherwell attack but he gifted possession to Lasley, who played in Ainsworth to slot the ball into the corner for his third goal in three games. McFadden powered a header against the bar following a Vigurs cross just before Sutton netted in the 65th minute when he ran on to a long ball from Vigurs and steered the ball home. McFadden played Ainsworth through two minutes later but Fox came off his line to block the shot and the former Everton player curled just wide from 25 yards as Motherwell threatened to embarrass the Jags. Thistle came closer to a seventh goal though but Twardzik slid to clear to deny Doolan a consolation after Hammell’s short backpass. It was an excellent day’s work for McCall’s men who now face a St Johnstone side full of confidence after a thumping win over Dundee United. “The second-half performance was unacceptable. We had a go in the second half and left ourselves wide open. “We started the game very well, made a number of chances and got the goal, but I thought Motherwell were more professional and precise, and individual errors cost us. “It’s probably naivety, after we scored the one we kept on trying to get more. We probably should have got another one but Motherwell went up the park and capitalised on our mistakes. “I thought we were a bit fortunate to go in at half-time 3-1. Thistle started the game really well, wee Lawless got a terrific goal for them and I thought he was coming back to haunt us. “But we got some really good footballing goals. It’s a big park, they like to play, so I thought it would be an open game, which it was. And we were just clinical.